We recently sat down and spoke with Rich Melman. 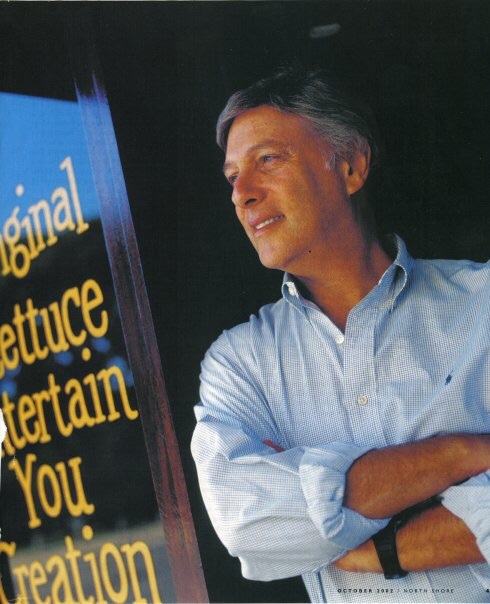 In case you don't know who he is, he's responsible for the creation of the Lettuce Entertain You Restaurant Group, which originally began right here in Chicago in 1971. It started with RJ Grunt's in Lincoln Park on June 10, of 1971. As of this writing, Lettuce Entertain You Enterprises now has over 90 restaurants across the United States! Let's hear from Rich himself, shall we? Hi Rich. As far as a fictional Mount Rushmore Chicago is concerned, you definitely belong on it. You are true Chicago History at it's finest & we just want to Thank you so much for everything you have created. What was it like growing up in and around Chicago? I had a beautiful childhood. I grew up in Logan Square and loved the neighborhood. I had tons of friends and played ball everyday. For me it was a perfect childhood and very sports oriented. What are some of your great memories of living here & the rise of LEY? Some favorite memories are of going to my first Cubs' game, going to Kelvyn Park High School, watching the Bears win the championship in 1963 and meeting my wife at RJ Grunts. Every passage of my life is full of special memories and almost all take place in Chicago. A predominant memory of opening the first restaurant on June 10, 1971 involves living through the struggles of opening that first restaurant. Waiting those first two and a half months for RJ Grunts to catch on with the public seemed like an eternity. Buying the Pump Room in 1975 was a bigger deal than I initially realized. People interviewed me from all across the country and even from Europe. I almost felt scared and wondered if I'd taken on too much. We made a success of it, but I realized that I had a lot to learn. Working through all my failures and challenges over the years has taught me a lot. What were your obstacles that stood in a young entrepreneur's path when you were first designing "LettuceEntertainYou" and how did you coin the name of the business? Was there a second choice that almost made the cut? A third? I wanted to name the company Applesauce Enterprises, but my wife didn't like the name, so she and her friend Kathy named it Lettuce Entertain You Enterprises. It really seemed to fit, since we were known for the salad bar at Grunts. My joke now is that having the word "apple" in your name is not the worst thing! The major obstacle we had is what most businesses face, which is getting people in the door, followed by other problems like food costs and needing better training. Entrepreneurs need to be positive, so I didn't let these bumps in the road stop me. Which restaurant/s were the originals? We have fond memories of the Grunt's in Glenview and Bones. I grew up eating at both restaurants on a regular basis & I mourn the fact that they are gone. Ha! RJ Grunts in Chicago followed by Fritz That's It in Evanston were Lettuce's first two restaurants. What was the main decision in turning Bones into L'Woods? Was it a hard decision. And also what caused you to close the Grunts in Glenview? I just remember the Chicago cartoon themed walls and menu's at Bones & Sima walking around with her cart with kasha or her pizza bagels, and it brings back the greatest Chicago History kind of memories ever! Sales were declining at Bones and the clientele was aging, but I liked the location in Lincolnwood, so I thought it was time to change the concept. I'm happy I did. I never wanted to do the RJ Grunts in Glenview, but one of my partners did. I just didn't want to duplicate my first restaurant. Then the owner of the property who was a friend of mine had an opportunity to sell it, so I decided to get out of my lease and we closed the restaurant. Don't get me wrong, L'Woods is somewhere we go to Weekly! But we miss Bones. It was like a museum to us. Did you feel the same? Any regrets about changing it to L'Woods? Would you ever consider bringing Bones back? No regrets. I was not attached to Bones and I'm happy with L.Woods today. Taking LEY to other states - what was that process like? It was difficult at first, but we had partners who wanted to move or expand. It was tricky at the beginning because it costs more to do business out of town and takes a while for your reputation to grow. I'm glad we've done it, but it was not easy. Is there one or two single menu items at any of your restaurants that you'd personally say are your all time favorites? Something that even you salivate about? In every restaurant there are items that are my favorites. My all time favorite is the medium rare cheddar burger at RJ Grunts. It's heavenly and the first burger we perfected for the menu at Grunts. Do you still live in the Chicago area? Could you ever see leaving Chicago? I still live in the Chicago area and will always see Chicago as my home base. What's ahead for Lettuce? Anything you'd like to promote? What is your vision for the evolution of LEY in it's overall future. We're opening an RPM Italian in DC and an MBurger in Aurora. We have a number of things on our agenda. I don't have long-term visions. I listen to my partners. I personally like to do new things to satisfy the artist in me. There's no five year plan - I just want to continue to do the things that are fun and that we can do well! I'm Jason, Chicago Historian in training, covering anything &amp; everything that has to do with Chicago and the whole state of Illinois , around the clock, 25/8! In the end, all we have is our story. Our memories. My job is to deliver a buffet full of old Chicago style memories.